Photo measuring 3.5 x 5.75 inches. You know I love old photos. Staring at faces that are looking back at me across the distance of a century or more can be captivating, even moving. But sometimes, I have to say, looking at people who are mostly unsmiling, posing stiffly in yards of itchy fabric, capturing on paper a moment, and probably a life, that is now long gone, it can start to feel, I don’t know, a little heavy. Sometimes I feel like I need to come up for air, to look at a newer photo, a candid photo, one with happy, smiling people. Sort of a palate cleanser, if you will. I was needing something light and refreshing today, so here is a shot that fits the bill (but is still somewhat vintage, of course, for this blog). this one is truly wonderful. i’m almost glad there are no words to contaminate the image. Thanks, Alessandro! I think I know what you mean. Sometimes a completely anonymous image can be the most transporting, and when we start adding information about names and dates and locations, it can lose some of its magic. I’m glad you’re enjoying these photos. 29 Apr 2012 at 3:02 pm M.O. 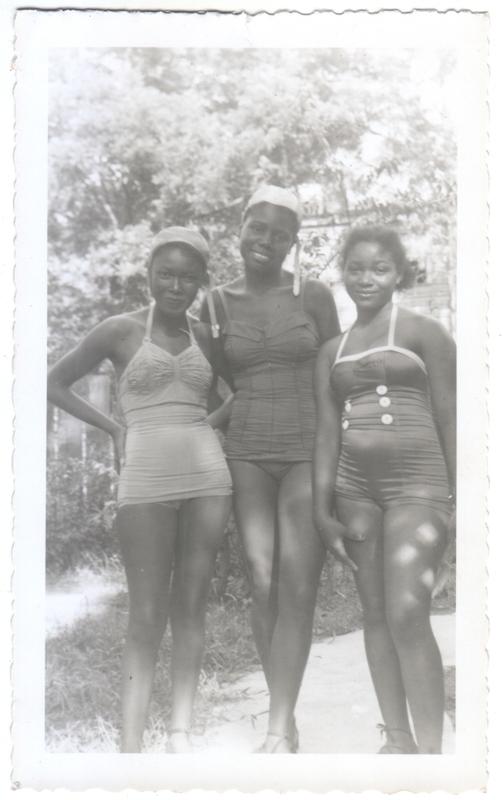 Three young ladies enjoying the summer – perfect! Wonder if they were at a lake, pond, private pool, etc. Good question. They seem to be at the edge of some woods, but that could be any of the options you mentioned.